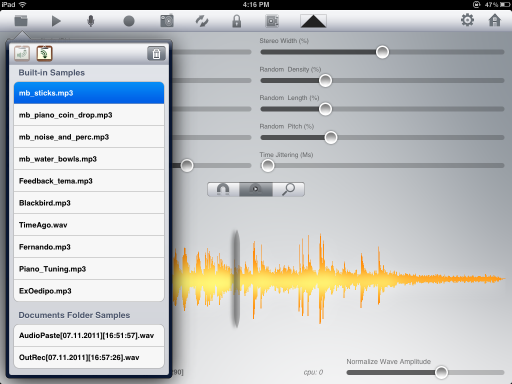 There are a lot of apps around that can do a lot of crazy things with audio files for effect. Something I’ve noticed though is few actually perform well in all aspects and features. Students of many, but masters of nothing syndrome, in some cases I suspect. iDensity is a strait up asynchronous sound file granular synthesis tool. It’s a suite of specific controls and features to warp audio in subtle to wildly creative ways. At first look it seems it doesn’t really do a whole lot, but that’s just not true. It is deceptively simple in appearance with a highly complex, and sophisticated engine that clearly has this type of audio design mastered. iDensity has all the tools you need on one screen to make adjusting audio files you can easily import via audio copy paste (Just added ACP in most recent update!) and or record directly through the iPad mic. It also supports iRig Mic as well. Real time scrubbing, pitch shifting, time jitter, stereo width, grain size, are a few of the main on screen functions controlled by simple sliders to increase or decrease effect. There are 8 grain envelope shapes, and 9 preset sample files. The real fun is when you bring in your own audio files and just play around with all the sliders, setting and scrubber. If things sound too loud, or need a boost there is a nice normalize wave amplitude slider as well. Recording is a snap, and copying to other compatible apps is just as easy. My only gripe is the recording time is a bit limited, but not badly. You can easily mix down your recordings for quick sharing in iTunes. For more details and information visit the apeSoft developers website. iDensity is a lot of fun, highly useful, and a quality granular FX suite producing outstanding results in a professional and clean interface. Cool! Thanks for the clear review. I am looking for some more "granular" or let's just say wicked effects for my voice / lyrics – does this also work realtime, like normal FX? Or can you only work with pre-recorded stuff. And do you know any app (outside of filtatron) that does?Supernice you;re doing this! Thanks everyone. Please remember, part of the deal for getting promo codes is to just email me in addition to the comment. That's how I can reply to you in a secure way to make sure you get the code. My contact info is on the right sidebar of this page. Thank you for visiting, and a bigger thank you as well for commenting. Wow, man, this is so cool! Awesome! Can't wait to get this and incorporate it into my next project. cheersGreat and very clear review dont have the app but like to struggle along. Wish I had the knowledge and music skills to do like you have. 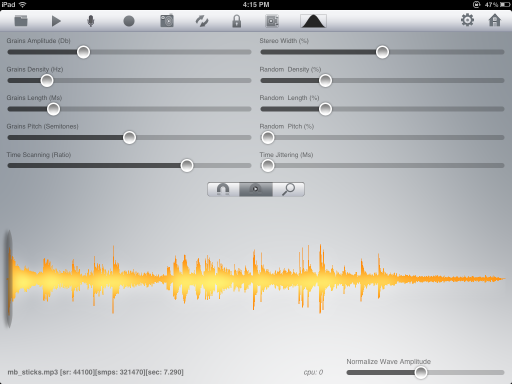 This could be an interesting addition to the FX/sound manipulation apps I'm starting to discover thanks to SmiteMatter. Definitely a different approach of interacting/tweaking sounds.